Happy Monday great foodie friends. The more I see what people consider food (especially the young and young families) the more I realize that we as a society need to get back to the basics. Don’t get me wrong, fast food every once in a while should be ok but making it the rule vs. the exception begs the term “You are what you eat”. I fully realize how busy life is and that time is short and a rare comoddity for most families but in some way or another through the generations one could always say the family is busy. Let’s look at this way, planning and learning are the keys to what I am proposing. Stay to the outer 4 walls of the grocery store. Watch cooking shows or look through cookbooks and plan out at least 5 meals for the week. A lot of foods or meals freeze well so you can make it ahead. Reduce refined sugars, salts and msg loaded seasoning. There are easy recipes to create your own seasoning, sea salts and healthy herbs that will make your foods taste much better. Do all of this with your kids! When you cook with your family it brings us back to our roots. Think about the “family” meal and sitting around the table with friends. It’s what connects us as people and what feeds our soul as well as our bodies. Teaching the young that hamburgers and French fires are not the healthiest way to eat but rather roasting a fresh chicken and serving it fresh vegetables are the “norm” will pay off for the future. Please don’t take this as a lecture but rather a friendly nudge to remember to learn where your food comes from. Make things fresh ahead that you can incorporate in your weekly meals (pasta sauce, chicken, beef or vegetable broths) and watch how you reconnect with your family and friends as you sit together, cook together and laugh together. Hi great foodie friends. It’s been sometime since my last blog as life can hop in the way sometimes. Atmosphere: Westcoast warmth and a balance of contemporary and traditional west coast. 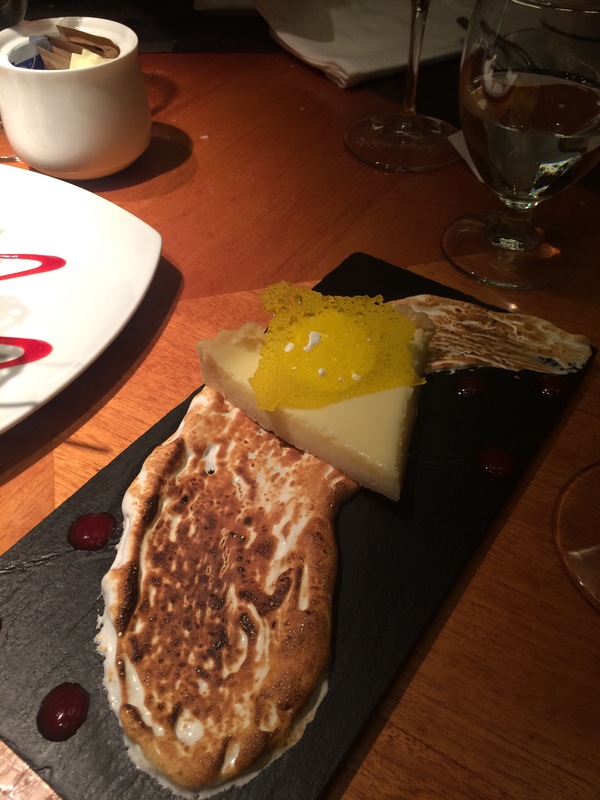 We happened to go to Sidecut located in Whistler at the Four seasons in September. Knowing we were in for a big meal we kept the appies to a minimum and they ended up not really being the star attraction. What I can say is that they are known for their steaks and coupled with a la cart sides that’s is where the star factor showed up! 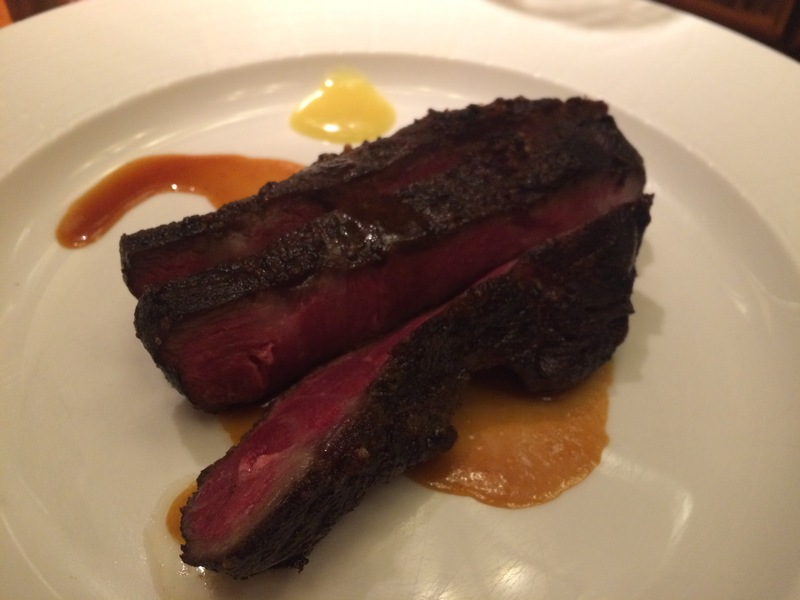 I had the WAGYU GOLD LABEL FLAT IRON 8OZ. $44 and it was cooked to perfection! True to its form the Wagyu was ripple marbled which kept it moist and very flavorful. Sidecut offers you 1 of 5 choices of seasoning, I chose the Black Angus. I added the CORN AND JALAPEÑO GRATIN $9. This side dish was out of this world good. We enjoyed our steaks with a nice bottle of Cabernet Sauvignon and the warm fresh bread with Maple butter. To finish we shared a few sweet treats. I was impressed with the presentation but honestly that is where the smile ended. If you are going to have a name like Everyone Loves the Lemon Tart – I think you have set the bar of expectations high. I honestly found it to fall flat, it wasn’t what I expected and wasn’t something that you wanted to keep diving into! Normally I love anything lemon or lime and protect my lemon dessert with my life! All in all a nice time with family, a great steak and sides but a sweet ending that wasn’t satisfying. All of my opinions are my own and reflect my personal opinions and tastes. Would I go back? Yes, the steaks and accompaniments were that good. The prices are a little steep but the quality of ingredients shine through.